ARTIFACT: This is a nice circa 1930s-World War II lapel wing for Continental Aircraft Motors. 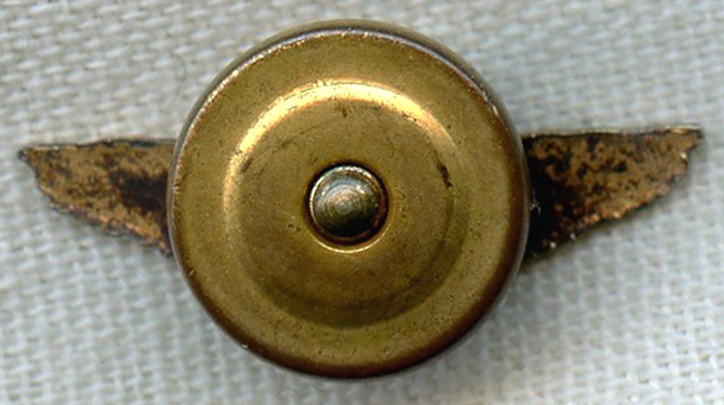 The pin is possibly in unmarked gilt sterling has a seven-armed winged propeller at center. VINTAGE: Circa 1930s-World War II. SIZE: Approximately 3/8� in height and 15/16� in width. CONSTRUCTION/MATERIALS: Possibly unmarked gilt sterling, enamel. ATTACHMENT: Singe screw post with disc backing. CONDITION: 7+ (Very Fine+): The wing has some small areas of light wear and medium tarnish, mostly on reverse.